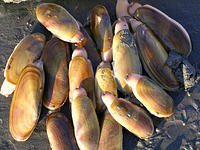 Listed below is some of the favorite Razor Clam Recipes from the locals in the Grays Harbor Beach area. Saute pork or bacon until crisp. Remove scraps from pan and reserve for use later as a garnish. Add chopped onion to hot fat, saute until tender but do not brown. Combine cooked onion and diced potatoes in a deep saucepan. Add water, bring to a simmer for about 15 minutes or until potatoes are done. Stir in clams and all other ingredients. Heat until piping hot, but do not boil. Serves 6. Notes: Forget the salt pork, bacon and the butter to try this tasty recipe to enjoy your razor clams and not feel guilty! This is a very forgiving recipe, so feel free to add more or less of these ingredients as you choose. Like my mother did, I always have home canned razor clams on hand for this recipe. They are tender, require almost no additional cooking and have a wonder “clammy” liquid that you want to be sure to include in your chowder. My motto with razor clam chowder is the more clams the better, so don’t be afraid to add more than is listed here. Also, leeks add a wonderful flavor that can’t be matched by onions. However, we always have leeks available in our winter garden so I’ll forgive you if you need to use an onionJ. I always like to add a little “kick” to my chowder using tabasco, sriracha, or a table spoon of horseradish. I’ll leave it to you to experiment for yourself. · 3 large cloves of garlic well diced. Using a large cast iron Dutch oven (or similar sized soup pot) sauté the leaks and the potatoes in 1 tablespoon of olive oil, until they just begin to brown. Add the diced garlic at the end and sauté for 3 more minutes. If you’re using fresh (or frozen clams) add them to the pot (when you add the garlic) and extend the sauté another 3 to 5 minutes. If using canned clams, add them directly to the sautéed ingredients along with the butter milk and the evaporated milk. Heat this to just below a simmer for a few more minutes or until potatoes are done. Heat until piping hot, but do not boil. Serves 6. Eggs, beaten (however many you need for your egg wash). Ritz Crackers, regular kind (not the low-fat or low-sodium varieties), crushed. Enough to coat the clams. Preparation: Turn your oven broiler on to high. It needs to be HOT. 1. Dip the cleaned clams in the egg wash.
2. Coat well with crushed Ritz crackers. 1. Put the pan on the top oven rack under the HOT broiler. 2. Broil 3 minutes. Turn over. Broil 3 more minutes, and they’re done. Avoid over-cooking or the clams get rubbery. The key is a HOT broiler or oven. You can do this in a HOT (500-degree) oven, without having to turn the clams over, but I’m not sure of the time. I prefer the broiler, thank you. Done right, the clams are fork tender. And with no grease or oil spatter and mess from a frying pan, you’ll probably never want to fry a clam again! Rich Daneker, KXRO Radio, Aberdeen, Wash.
Rinse clams, drain, dip in flour, egg, and roll in cracker crumbs. Using high heat, fry in 1/4 inch oil in pan. Brown quickly for one minute or until brown per side. Take out and lay out on paper towels to absorb any grease, then serve. 1 C. dry white wine, very dry sherry or vermouth. Saute onion and garlic (crushed) in butter and oil combined until almost tender. Add spices. Combine wine and clam juice and add it at this point - simmer to reduce some liquid then pour in the clams, parsley and cheese. Simmer for a few minutes to warm up clams. Add salt and pepper. Pour the whole pan of sauce on your cooked spaghetti. Sprinkle on more cheese as desired. Combine and stir oil and seasonings, then add clams. Bake on cookie sheet or in shallow pan at 350 degrees for 1 hour. Stir and drain frequently, saving juice. Store clams and juice in air-tight container. Will keep in refrigerator 2-3 weeks. Run cheese flavored goldfish crackers through a food processor and use them for the breading for frying the clams. The herbed, cheesy flavor is delicious. 1-2 finely chopped green onion(s) for flavor and garnish chili powder or paprika for some "kick & color"
Cook on Power 8 (sauté) ~ 1.5- 2 min. in microwave in container with vented lid. CAUTION: Do not overcook clams!! (Unless you like chopped rubber bands.) You can always cook a little more if need be. Note: For thinner consistency, add or substitute sour cream, cottage cheese or plain yogurt for some of the cream cheese.